Collect up to 3 streams in 1 container. Go from single to double to multi-stream in 5 minutes – no tools required! Connectors made from high-strength aluminum keep multiple bins neatly side by side. Go from single-stream to double-stream to multi-stream in a snap – no tools required! Transition® technology converts your 50 gallon bin in 5 minutes with our snap-together opening system. You won’t ever need three bins again! 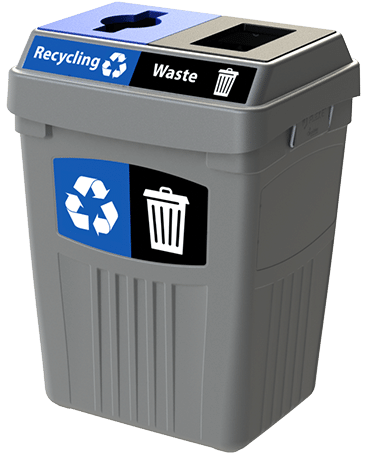 Get the function of up to 3-Streams for the cost of just one bin. 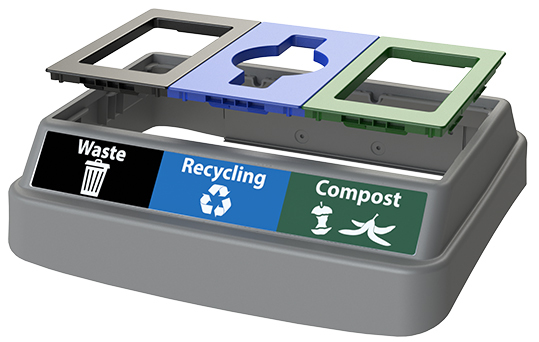 Versatile and flexible to solve almost any recycling need. 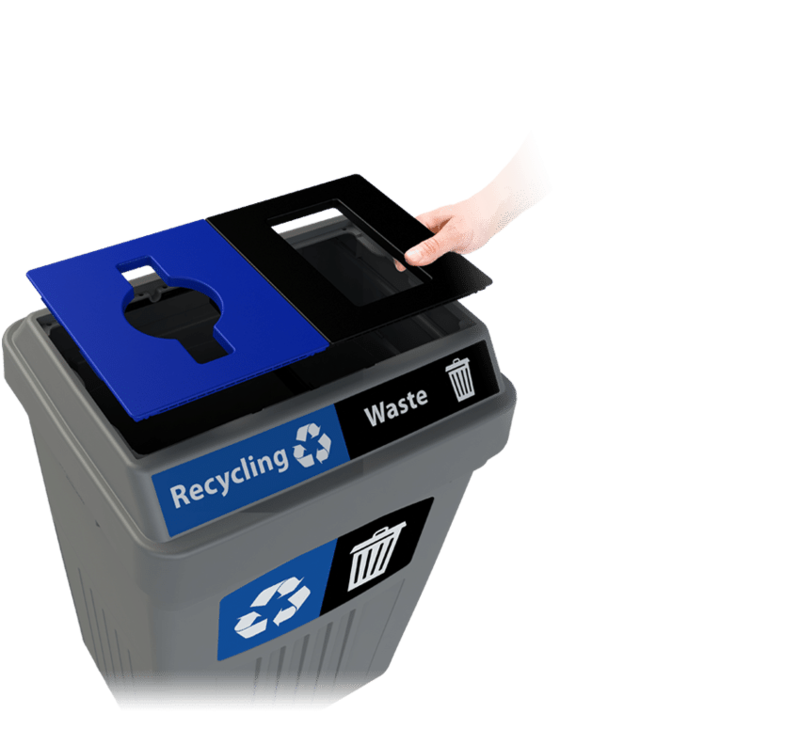 Help direct more waste into recycling with high-impact graphics. Lids include ultra-clear stream labels on both sides, plus get optional base and backboard labels. 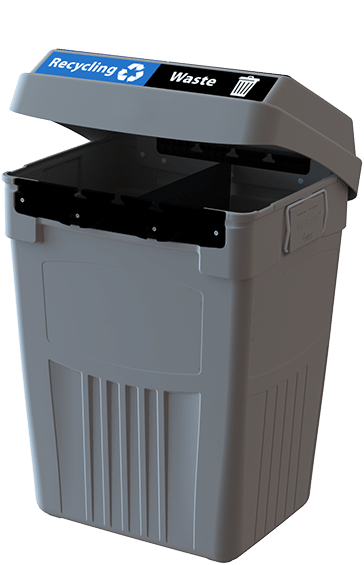 Streamline the service and maintenance of your bins with the vented design and optional hinged lid that allow for easy bag removal. Plus our unique bag tie system quickly secures bags in place. 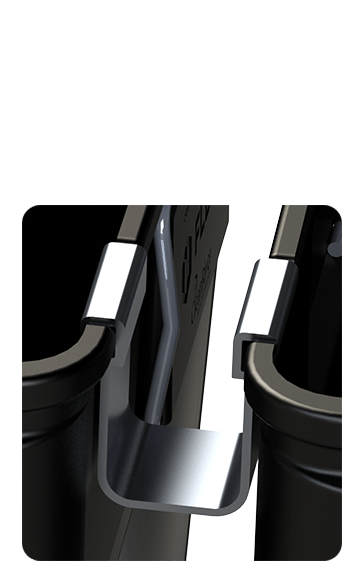 High-strength aluminum connectors keep your bins securely attached to each other – no tools needed. 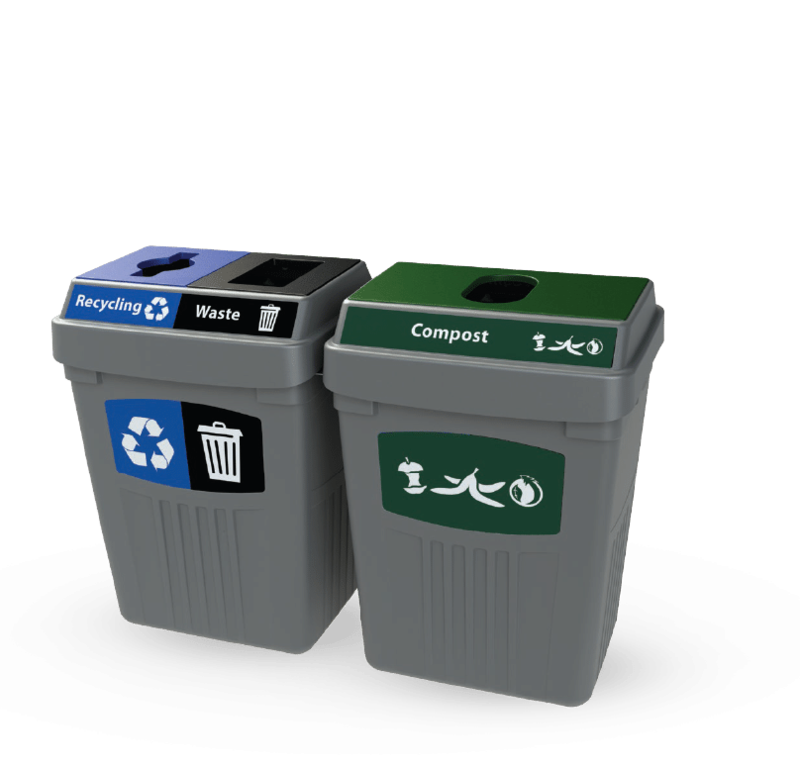 Made from 55% recycled High Density Polyethylene (HDPE), available in 1, 2 or 3 streams and includes high impact lid labels. Add any of our extra features, select from standard graphics and streams or customize to your needs. Copyright 2017 © All Rights Reserved, Midpoint International Inc.
1.1 The “Win Your Bins” contest is a limited duration contest (“Contest”) sponsored and administered by CleanRiver Recycling Solutions, a division of Midpoint International Inc., a corporation incorporated under the laws of Ontario, Canada (“Contest Sponsor”). 2.1 The Contest begins on March 23, 2017, at 12:01:00 PM EST and ends on July 10th 2017 at 11:59:59 AM EST unless earlier suspended or terminated by the Contest Sponsor (“Contest Period”). 3.1 The Contest is open during the Contest Period only to individuals resident in Canada (excluding residents of Quebec) or the United States of America (“USA”): (a) who are employed by a corporation on a full-time basis at a physical location within Canada (excluding Quebec) or the USA; and (b) who have reached the age of majority in their province, territory or state of residence as of the date such individual submits their entry (“Entry”) to the Contest Sponsor in the Contest (“Entrant”). 3.2 The Contest is not open to any individual resident in the Province of Quebec or to any resident of any geographic area within Canada or the United States of America where the Contest is void, unlawful, prohibited, or restricted by law. Any Entry submitted by a minor or by any individual on behalf of a minor shall be void and of no force or effect. 3.3 Directors, officers, employees, shareholders, representatives and agents of the Contest Sponsor, each of the Contest Sponsor’s parent, related, and affiliated companies, their respective advertising and promotion agencies, the independent judging organization, and members of their immediate families (such as their father, mother, brothers, sisters or children), their legal or common-law spouses, and all persons with whom any such individual resides are excluded from participating in the Contest and are not eligible to receive any prize in the Contest. 4.1 By participating in any way in the Contest, each Entrant fully and unconditionally accepts, and agrees to abide by, all of these Official Contest Rules (“Official Contest Rules”) and by all decisions of the Contest Sponsor, which decisions shall be final and binding on all matters related to the Contest, including without limitation, the awarding of each Prize. 4.2 Each Entrant agrees that all rights that an Entrant may have to participate in the Contest and to claim any prize related to the Contest are conditional upon the Entrant fully complying with all of these Official Contest Rules. 5.1 A quantity of Flex E™ recycling bins manufactured and provided by the Contest Sponsor and having a total estimated retail value as a group of up to approximately $ 5,000 USD (“Prize”) will be awarded by the Contest Sponsor to each of five (5) winning Entrants provided each such Entrant fully complies with these Official Contest Rules ("Prize Winner"). 5.2 The maximum total number of prizes to be awarded by the Contest Sponsor in this Contest is therefore five (5), with all five (5) prizes (“Prizes”) having a total maximum retail value as a whole of up to approximately $ 25,000 USD. 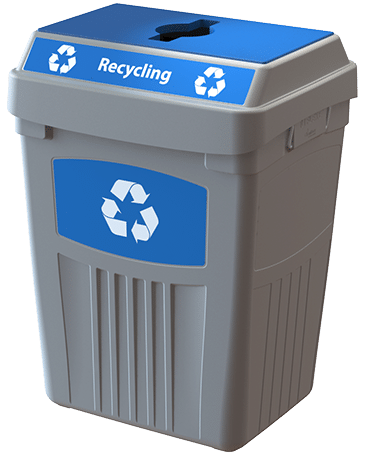 5.3 As part of his or her Prize, each Prize Winner may irrevocably select up to four different types of Flex E™ recycling bins manufactured and provided by the Contest Sponsor. 5.4	A description of each of the four different types of Flex E™ recycling bins which a Prize Winner may select as part of his or her Prize can be found at flexebins.com (“Flex E™ Bins”). 5.5 The selection by a Prize Winner of the specific type(s) of Flex E™ Bins which a Prize Winner wishes to claim as part of his or her Prize shall be irrevocable, final, and binding upon the Prize Winner. 5.6 Once a Prize Winner has selected the different types of Flex E™ Bins which the Prize Winner desires, that selection of Flex E™ Bins shall constitute the Prize for that Prize Winner. 5.7 The estimated retail value of each Prize is up to approximately $5,000 USD excluding all applicable taxes. Each Prize Winner shall be solely responsible for the payment of all taxes payable with respect to a Prize won by the Prize Winner. 5.8 The Prize must be accepted by the Prize Winner as selected by the Prize Winner and awarded by the Contest Sponsor (no changes or substitutions) and may not be transferred or assigned by the Prize Winner. 5.9 A Prize may not be redeemed for cash by the Prize Winner and has no cash surrender value. Any difference between the stated estimated approximate retail value and actual value of a Prize will not be awarded by the Contest Sponsor, nor shall the Contest Sponsor have any liability to any Prize Winner for any such difference, howsoever arising. 5.11 The Prize Winner shall be responsible for unpacking and installing the Prize within its facility located in Canada (excluding Quebec) or the USA. 5.12 Each Prize awarded pursuant to this Contest does not include the supply by the Contest Sponsor, or any of its parent, affiliated, or related companies, of any maintenance, support, or similar services related to the Prize. 5.13 The Contest Sponsor reserves the right to substitute another prize of comparable value if any Prize is not available for any reason as determined by the Contest Sponsor. 6.1 No purchase is required to enter the Contest. To be entered into the Contest, your fully completed and signed Entry document; (a) must be mailed by you to the Contest Sponsor during the Contest Period by prepaid first class mail; and (b) received by first class mail by the Contest Sponsor during the Contest Period at the Sponsor’s address set out above. 7.1 EACH ENTRANT MAY ONLY SUBMIT ONE ENTRY IN THE CONTEST. ANY AND ALL ADDITIONAL ENTRIES SUBMITTED BY THE SAME ENTRANT SHALL BE VOID, OF NO FORCE OR EFFECT, AND SHALL NOT BE ENTERED INTO THE CONTEST. 8.1 TO BE ENTERED INTO THE CONTEST, EACH ENTRY MUST: (A) COMPLY WITH ALL OF THESE OFFICIAL CONTEST RULES; AND (B) BE RECEIVED BY THE CONTEST SPONSOR DURING THE CONTEST PERIOD WHICH CLOSES AT 11:59:59 AM EST ON MAY 31, 2017 (“CONTEST CLOSING DATE”) THROUGH ONE OF THE TWO AUTHORIZED METHODS SPECIFIED IN SECTION 6 ABOVE. 8.2	EACH ENTRY RECEIVED BY THE CONTEST SPONSOR AFTER THE CONTEST CLOSING DATE SHALL BE VOID, OF NO FORCE OR EFFECT, AND SHALL NOT BE ENTERED INTO THE CONTEST. 9.1 Each Entry in the Contest is subject to verification by the Contest Sponsor for compliance with these Official Contest Rules. 9.2 Each Entry that is illegible, mutilated, incomplete, fraudulent, late, or otherwise fails to comply with any of these Official Contest Rules shall be void, disqualified and rejected by the Contest Sponsor, and of no force or effect. 9.3 The sole determination of time in relation to the Contest Sponsor's receipt of a valid Entry shall be the time of receipt of such Entry indicated by: (a) the computer server(s) used by the Contest Sponsor for the Contest; or (b) the mail log in procedure used by the Contest Sponsor with respect to any Entry received by the Contest Sponsor by way of mail. 9.4 If more than one Entry complying with these Official Contest Rules is received by the Contest Sponsor from any one individual, e-mail address, or physical address, the first Entry received and processed by the Contest Sponsor will be considered the only valid Entry received from that person, e-mail address, or physical address. 9.5 Each further Entry received from any such individual, e-mail address, or physical address shall be void, of no force or effect, and shall not be entered into the Contest. 9.6 The Contest Sponsor reserves the right at all times to reject or disqualify: (a) each Entry which fails to comply with these Official Contest Rules in any way; (b) each Entry generated by any script, macro, robotic, web crawler, programmed, or any other automated means; and (c) each Entrant, Potential Winner, and/or Prize Winner which the Sponsor believes: (i) is in breach of any of these Official Contest Rules; (ii) has attempted to tamper with the Contest in any way including the Contest process; or (iii) to be ineligible or disqualified from participating in the Contest or collecting a Prize. 9.7 Each decision by the Contest Sponsor related to, arising out of, or connected with the Contest, including, but not limited to, the eligibility of any Entry, Entrant, Potential Winner, or Prize Winner, the disqualification of any Entry, Entrant, Potential Winner, or Prize Winner, and the awarding of any Prize or Prizes shall be final and binding in all respects upon each Entrant and upon all other parties. 10.1 Five (5) potential winners of the Contest (“Potential Winner(s))” will be selected at a random draw conducted by the Contest Sponsor’s representative, Octopus Ink, at approximately 12:00 PM EST in Toronto, Ontario on July 17th, 2017 (“Draw Date”) from amongst all of the entries received by the Contest Sponsor prior to the Contest Closing Date which comply with these Official Contest Rules (“Entries”). 10.2 The odds of an Entrant winning a Prize in the Contest depend on the total number of eligible Entries received by the Contest Sponsor prior to the Contest Closing Date and the Entrant’s compliance with these Official Contest Rules. 10.3 Within five (5) business days immediately following the Draw Date, the Contest Sponsor will attempt to: (a) contact each Potential Winner using the e-mail address and telephone number supplied by the Potential Winner as part of his or her Entry; and (b) send a “Winner’s Declaration And Release Form (“Winner’s Declaration Form”) to each Potential Winner by e-mail using the e-mail address supplied by the Potential Winner as part of his or her Entry. sign and return the Winner’s Declaration Form to the Contest Sponsor without modification within ten (10) business days immediately following the Draw Date. 10.5 Provided the Potential Winner fulfills each of the conditions set out in Section 10.4 above by the relevant times indicated above and the Potential Winner complies with all of these Official Contest Rules, the Potential Winner shall be declared a Prize Winner by the Contest Sponsor (“Prize Winner”). In such event, the Contest Sponsor will contact the Prize Winner to inform him or her of how the Prize will be shipped to the Prize Winner by the Contest Sponsor. 10.6 If a Potential Winner: (a) cannot be contacted by the Contest Sponsor by email or telephone within three attempts made by the Contest Sponsor within five (5) business days immediately following the Draw Date; (b) fails to correctly answer the Skill Testing Question within (10) business days immediately following the Draw Date; (c) fails to sign and return the Winner’s Declaration Form to the Contest Sponsor within ten (10) business days immediately following the Draw Date; (d) declines the Prize; or (e) is otherwise declared ineligible by the Contest Sponsor to receive the Prize; the Potential Winner shall automatically be disqualified and shall forfeit his or her potential Prize without further notification by the Contest Sponsor. 10.7 In such event, an alternate Potential Winner will be randomly selected at a second, and if necessary subsequent, random draw conducted by the Contest Sponsor’s representative, Octopus Ink, in Toronto, Ontario as soon as is practicable from among all of the remaining Entries excluding any Entry submitted by any disqualified Potential Winner described in Section 10.6 above. 10.8 The provisions contained in Section 10.3 through Section 10.7 above shall then be followed by the Contest Sponsor with respect to each alternate Potential Winner selected at such second or subsequent random draw until such time as an alternate Potential Winner is declared to be a Prize Winner by the Contest Sponsor. 11.1 By submitting an Entry in the Contest, each Entrant, Potential Winner, and Prize Winner irrevocably consents to the Contest Sponsor collecting, using, and disclosing personal information about such individual, including without limitation, such individual's name, hometown, photo, image, likeness, and statements (“Personal Information”); (a) to administer, operate, and complete this Contest; (b) to identify an Entry, Entries, Entrants, Potential Winners, and Prize Winners; (c) for promotional, advertising and marketing purposes on behalf of the Contest Sponsor and/or the Contest Sponsor’s parent, related, and affiliated companies; in any and all forms of media throughout the world without additional compensation being paid to any such individual. 11.3 Upon request, each Entrant, Potential Winner, and Prize Winner will sign and provide a written privacy consent to the Contest Sponsor authorizing all such collection, use, and disclosure of Personal Information. 11.4 The Contest Sponsor will not disclose any Personal Information collected by the Contest Sponsor pursuant to these Official Contest Rules to any third party except to administer, operate, and complete the Contest, award a Prize, or ship a Prize to a Prize Winner. 12.1 Each Entrant, Potential Winner, and Prize Winner agree that none of the CONTEST SPONSORS (as defined in Section 13.1 below) have made or provided any representation, warranty, condition, or guarantee of any kind related to the Contest, these Official Contest Rules, any Entry or Entries, any Entrant, the selection of any Potential Winner or any Prize Winner, or any Prize or Prizes. 12.2 The CONTEST SPONSORS disclaim any and all express and implied warranties, conditions, and guarantees of every kind related in any way to the Contest, these Official Contest Rules, any Entry or Entries, any Entrant, the selection of any Potential Winner or Prize Winner, and/or any Prize or Prizes. 13.1 neither the contest sponsor, any of its parent, subsidiary, and affiliated corporations, any advertising or promotional agency involved in the contest, or any of their respective directors, officers, employees, shareholders, representatives, or agents (individually and collectively referred to as the "CONTEST SPONSORS") shall have any liability whatsoever to any entrant, potential prize winner, prize winner, or any other party or parties for any: (a) failure to enter, or delay in entering, any entry or entries in the contest; (b) incomplete, illegible, lost, damaged, stolen, fraudulent, misdirected, or mutilated entry or entries; (c) unsuccessful attempt(s) to participate in the contest; (d) inability to download any information or documents necessary to participate in the contest; (e) error(s) or omission(s) in any advertising or media material(s) related to the contest; or (f) event(s) relating to the contest which are outside the reasonable control of the contest sponsor; howsoever arising, whether caused by technical problems, interruptions to telephone, computer, internet, or website lines, networks, interfaces, or connections, on-line systems, servers, providers, computer equipment, or software, congestion on the internet, at any web site, or any combination thereof, lost or delayed mail, postal disruptions, postal delays, postal strikes, or by any other cause, howsoever arising. 13.2 each entrant, potential winner, and prize winner, on behalf of themselves and their respective executors, administrator, beneficiaries, successors, representatives, and assigns agree that the contest sponsor’s total, cumulative, and aggregate liability to any and all entrant(s), potential winners, prize winner(s), and/or any other parties arising out of, related to, or in any way connected with: (a) the contest, these official contest rules, any and all entries, any and all entrant(s), the selection of potential winners or prize winners, and/or any prize(s); (b) any and all breaches by the contest sponsor of these official contest rules; (c) any termination or suspension of the contest by the contest sponsor; (d) any error or mistake in awarding any prize(s) by the contest sponsor’s representative, octopus ink, or by the contest sponsor; (e) any failure of the contest sponsor to award any prize(s); and/or (f) any other act, omission, or event related in any way to the contest, these official contest rules, any and all entry(s), any and all entrant(s), the selection of potential winners or prize winners, and/or any prize(s); shall not exceed the sum of twenty five thousand dollars usd ($25,000.00 USD) inclusive of any and all such liability, howsoever arising, whether such liability is based in contract, tort, at law, in equity, in restitution, and/or upon any other theory of liability, howsoever arising. 14.1 The Contest Sponsor reserves the right to terminate, cancel, suspend, or modify the Contest, in whole or in part, at any time or times in any way that the Contest Sponsor considers necessary or advisable at the Contest Sponsor's sole discretion, without advance notice being provided to any party or parties, including without limitation, any Entrant, Potential Winner, or Prize Winner. 14.2 The Contest and these Official Contest Rules shall be governed by and construed solely in accordance with the laws of Canada and the Province of Ontario, Canada. 14.3 Any and all disputes arising out of, related to, or in any way connected with the Contest, including without limitation, these Official Contest Rules, any and all Entries, any and all Entrant(s), the selection of Potential Winners, Prize Winners, and/or any and all of the Prizes ("Dispute(s)") shall be adjudicated exclusively in the courts of the Province of Ontario, Canada located in Toronto, Ontario, Canada. 14.5 Each Entrant, Potential Winner, and Prize Winner hereby irrevocably and fully waives all rights they may have under the laws of the Province of Ontario or any other jurisdiction to initiate or maintain any class action proceeding against the Contest Sponsor and/or CONTEST SPONSORS relating in any way to any or all Dispute(s). 14.6 None of these Official Contest Rules may be waived by the Contest Sponsor unless such waiver is contained in a written document signed by the Contest Sponsor. 14.7 Any and all decisions by the Contest Sponsor related to, arising out of, or connected in any way with the Contest, these Official Contest Rules, any and all Entries, any and all Entrants, the selection of Potential Winners or Prize Winners, any and all of the Prizes, and/or any and all Dispute(s), shall be final and binding in all respects upon each Entrant, upon each Potential Winner, upon each Prize Winner, and upon all other parties. 14.8 The Contest Sponsor reserves the right to amend, delete, add to, or otherwise change any or all of these Official Contest Rules at any time or times without advance notice being provided to any party or parties, including without limitation each Entrant. 14.10 Each Entry submitted in this Contest shall immediately become the property of the Contest Sponsor and will not be returned. 14.11 Should any provision of these Official Contest Rules be deemed contrary to applicable law and/or unenforceable by any court of competent jurisdiction, such provision shall be considered severed from these Official Context Rules but all remaining provisions shall continue in full force. 14.12 This Contest shall automatically be void where prohibited by law. 14.13 All Entrants, Potential Winners, and Prize Winners fully consent to being contacted by the Contest Sponsor, or the Contest Sponsor’s representatives, by e-mail or other electronic communication for all purposes related to this Contest, including without limitation, related to the Official Contest Rules, any Entry, the Draw, any Potential Winners, any Prize Winners, and/or any Prize which e-mail or other electronic communication shall be as effective as delivery of an originally executed written copy thereof. 14.14 These Official Contest Rules constitute the sole and entire Official Contest Rules. 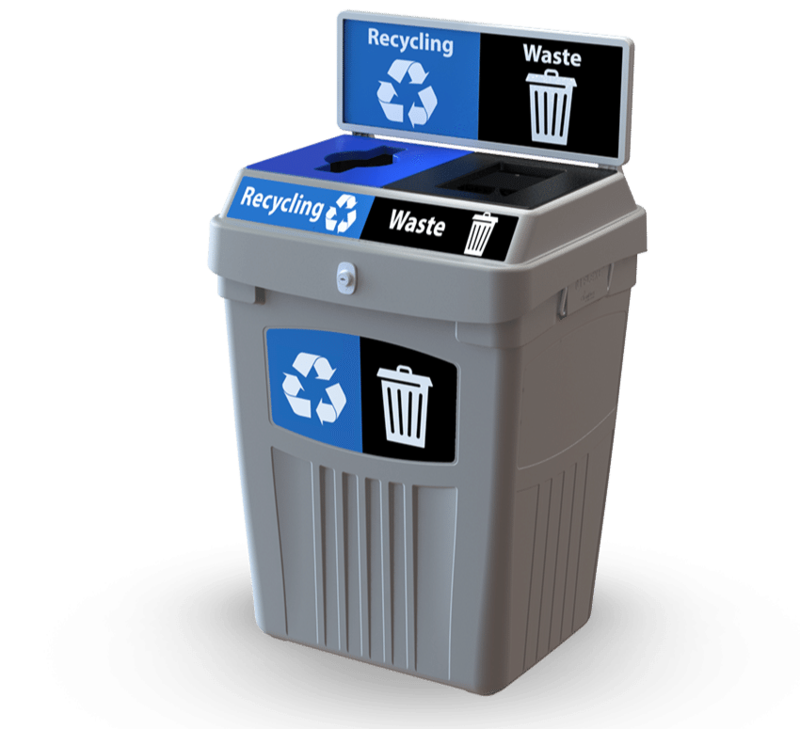 Get in touch with our sales team for more info about ordering your Flex E bins. Complete the following form and we’ll get back to you within 1 business day. 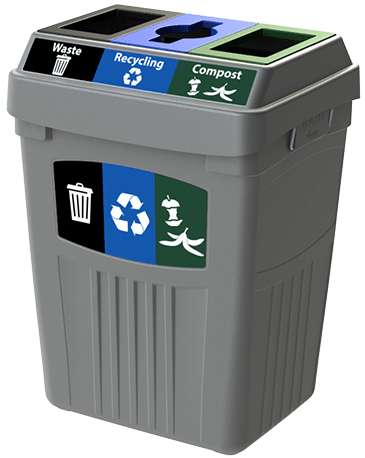 We’re excited to bring you the all new Flex E bins. Our sales team can help answer any questions or prepare a no-obligation quote! 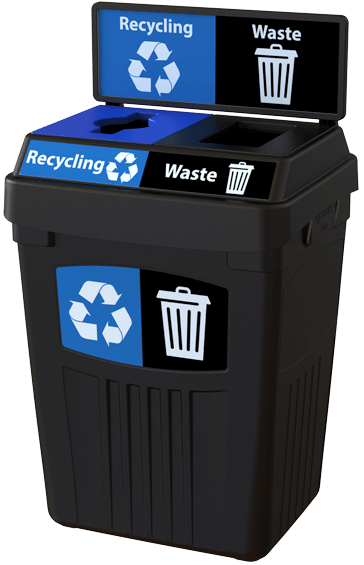 Want to know more about the Flex E bins? Our sales team can help answer any questions you have or provide a no-obligation quote.